Kessel Blond and Kessel 69 are produced throughout the year. The three aperitif beers are always available as well. In addition, a seasonal beer is brewed each season: the so-called specials. In spring, we produce the Holsbeekse Lentetripel/Spring Triple; in the summer you can try our Caroussel special; and finally, you can light up your dark winters with our Xmas special. The original location Kessel-Lo still lends its name to our two standard beers. The names of our more recent beer types are connected to the current location of the brewery or to one of the several partners we have worked with to create our unique beers. Our aperitif beers (Gulden Delle - Ferme Framboos and Brut) are a nod to vine culture, similar to what medium dry, rosé and brut are for sparkling wine, cava or champagne. The original location of De Vlier in Kessel-Lo still lends its name to the Brewery. 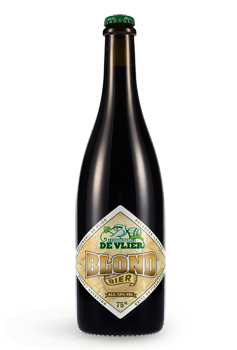 De Vlier Blond is a clear straw-coloured beer of high fermentation (7.5% ABV) with a thick veil and a huge white head, somewhat adhesive. The aroma is fresh, with hops, apple and citrus. After a neutral start, a fruity, sparkly taste with a hint of honey and an aftertaste of light hops hits. With taste evolution, unfiltered and unpasteurized. 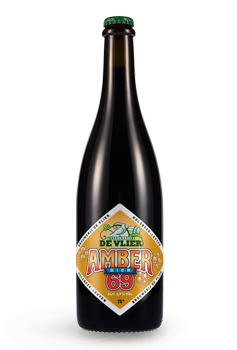 Amber 69 is an amber coloured beer of 6.9% ABV Cloudy with an adhesive white head. It has a malty aftertaste and a pleasant bitterness. The number 69 refers to Marc’s year of birth, 1969. With taste evolution, unfiltered and unpasteurized. De Vlier Dark is a lovely dark beer. With this dark beer we complete our basic range of three beers: Blond, Amber 69 and ...Dark. This soft dark beer of high fermentation is made with special malts and sugar candy leading to touches of coffee and chocolate in taste. With taste evolution, unfiltered and unpasteurized. 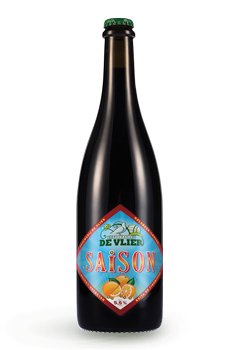 With Saison of De Vlier masterbrewer Marc Andries managed within the definition of Saison to make a typical ‘De Vlier’-beer. Acidity is added to this beer in the brewhouse.The use of wheat, Styrian hops, coriander en curaçao and the light sweetening make the beer full of taste, slightly bitter,fruity, very refreshing and still low in alcohol content. Carrousel beer was brewed for the first time at the request of cultural centre 30CC (Leuven) to celebrate the unique folk festival in Kessel-Lo on Saturday, May 14, 2011. Master brewer Marc selected four grains and some hops varieties to create a unique lager with a distinctive fresh and fruity character. The beer is made with spelt malt which adds a slight acidity to the beer. We use a new hops variety, Simcoe, which gives this beer its refreshing citrus character. With taste evolution, unfiltered and unpasteurized. Our erstwhile classic, the Xmas, is completed with a mix of gingerbread spices from Stef de Feyter (Damiangingerbread and -coffee). This was the birth of Xmas Spicy. 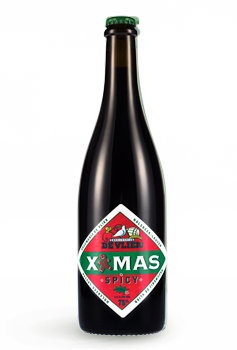 The beer immedialtely gets you in a Christmas mood. Stef is also inspirator of Kids for Uganda and part of the profit goes to this good cause. Only available in the winter months as long as in stock. This dark beer with high fermentation is prepared with special malts producing touches of coffee and chocolate. With taste evolution, unfiltered and unpasteurized. 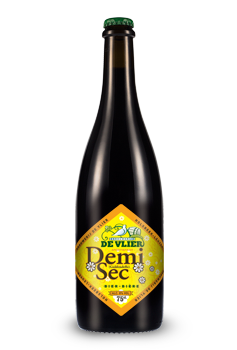 Our Winter Stout is a typical beer for the cold season.To get through the cold winter months and to gain strength, Brewery De Vlier presents this multigrain beer. This dark beer of high fermentation is made with special malt which adds coffee and chocolate flavour. With taste evolution, unfiltered and unpasteurized. 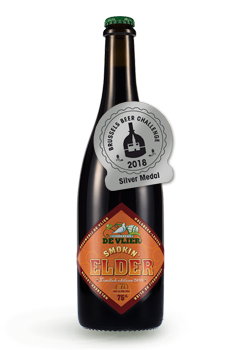 Smokin’ Elder is exclusively brewed on demand of and for Dranken Jeroen. Jeroen started at the same time as the brewery, in 2008. Being real fanatical beer lovers Jeroen and his father Rudy are also ardent whisky lovers. During a delivery from the brewery to the off-licence the idea developed to create a whiskybeer, exclusively for the off-licence. After many trial concoctions and tastings the choice fell upon this unfiltered straw yellow blond beer with its typical turfaroma, a robust bitterness from a great quantity of Saaz hops and a fresh aftertaste from juniper berries. Brut is De Vlier’s festive beer. Perfect as an aperitif and on festive occasions. This beer has lovely fresh acidity through a complex fermentation process. The secondary fermentation with champagne yeast creates strong carbonic bubbles and a full flavour. With taste evolution, unfiltered and unpasteurized. The excellent companion to a festive event. You are looking for an alternative to cava, crémant or champagne? Look no further, you found it! Main fermentation with bottom fermenting yeast and lactic acid bacteria. Fermentation in the bottle with champagne yeast. Two local products unite to create this unique aperitif beer! De Ferme Framboos is a farm in Sint-Agatha Rode that produces juice from its own ecologically grown raspberries, which gives this beer its distinctive flavour and colour consistency. Brewery De Vlier uses a sour-sweet beer as a base, which is gained through a complex fermentation process. Combined with the delicious raspberry juice, this results in a divine drink! The rosé-aperitif beer is the last of the brewery’s trio of aperitif beers. With taste evolution, unfiltered and unpasteurized. 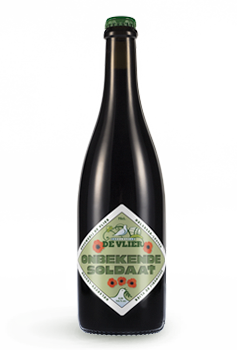 The Onbekende Soldaat is a beer that wants to keep alive the memory of the fallen in the wars. 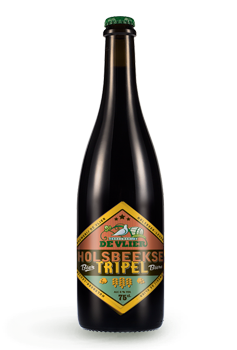 It is a dark three-grain beer with high fermentation with acidification yielding a soft, creamy aftertaste with touches of caramel, chocolate and coffee.With the Onbekende Soldaat, the automn beer of brewery De Vlier, the range of seasonal beers is complete. With taste evolution, unfiltered and unpasteurized. Pilsner malt (barley), chocolate- and wheat malt and oat flakes. 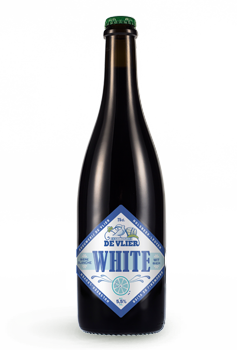 With De Vlier White masterbrewer Marc Andries completes the range of Belgian classics. The compound with 50% wheatmalt, coriander, curaçao (sweet zest of orange) yields the typical fresh white with thick head. Drink it cold. With taste evolution, unfiltered and unpasteurized. The ‘Dréke’ (Andy) from De Vlier is a golden yellow beer of low fermentation (7.5%ABV) with a white head that sticks to the side of the glass. It is an exclusive edition of the blond (only 400 bottles) with a macerate of wild hops, harvested by the next door neighbour, André and competently picked and dried by his wife Elza (year of crop 2016) Thus the beer has an extra touch of hops. Fresh on the nose, with apples and citrus. After a rather neutral start in taste follows a tingling fruitiness, a touch of honey and a resolute hoppy aftertaste. With taste evolution, unfiltered and unpasteurized.